The Images: Upper left is the San Bernardino Flood Control and Transportation department, they hold the keys to successful bike route developments throughout the County! Just had to stop by on the ride over to the Metrolink station in San Bernardino-Upper Middle. Upper Right is the Green Line stop that should have continued to LAX! You have to catch a shuttle bus from here to the airport? 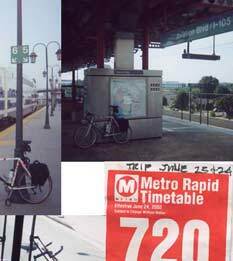 Middle Right the Metro Rapid schedule from its first day out Sunday, June 24, 2001, Center, the bus ride to the Red Line, Middle left my bike on Metrolink, Lower left a cool trail through Marina Del Rey, Lower Right, a view from the ride home, I had to stop and photograph the clean air and great view of the mountains Sunday afternoon! A celebrated event occurred on the weekend of June 23&24th, the 40 year hegemony of the automobile was broken by the start of Sunday service on the Metrolink! No longer does one have to drive a car to LA to enjoy a weekend there. 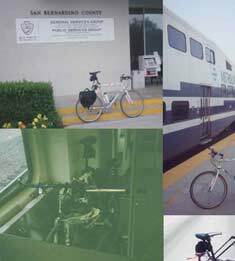 In fact I rode my bike to the San Bernardino station, hopped the Metrolink on Saturday, arrived in LA Union station, transferred bike and self to the Red line light rail/subway to the Blue line to the Green line to LAX. 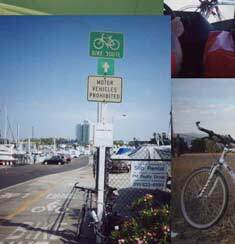 Then I found the South bay bike trail and rode it most of the way to my sister and brother-in-laws place in Santa Monica. I dropped off my sister's paniers in Santa Monica (we borrowed em' for the trip back East) and rode home light! Rode Redline, Blueline, Green Line to LAX  80 minutes appx. For those interested, Catching the train to LAX is an easy way to avoid paying parking fees and avoiding traffic headaches. It takes about an hour and a half from Union Station to LAX with three transfers and one short bus ride (why they did not extend it one mile further into LAX baffles logical thinking, but so does anything driven by special interests I guess. We had some awesome adventures hiking in the Santa Monica mountains and Swimming in the surf. The five of us drove North a few miles to avoid some of the serious water pollution problem plagueing Southern Californias coast. See Surfrider foundation for more. Hung out and just had a great evening, and Sunday I decided to try another way home to try to cut some time off. 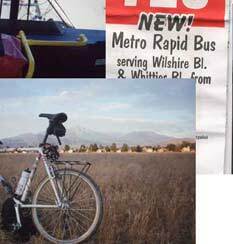 2:20 Took the Transit Metro Rapid 720 bus with bike rack to Wilshire and Western: 65 minutes. Was home before dark with a sense of accomplishment, and a powerful sense that a renaissance of transit opportunities is beginning in Southern California and I was there to witness its first day! Word on the train was that it was totally packed with over 400 people on the inbound and outbound Sunday trains. That represents a significant reduction in car miles driven and pollution spewed. Maybe that is why upon returning to San Bernardino the valley was crystal clear for the first Sunday in June that I can remember! Long live pollution prevention and clean air. The ride in was an hour longer because I was able to throw in a great ride from LAX to Santa Monica along the coast. Both routes were great, and run frequently, every 15 minutes on the weekends and every 5 to 10 minutes on the weekdays.